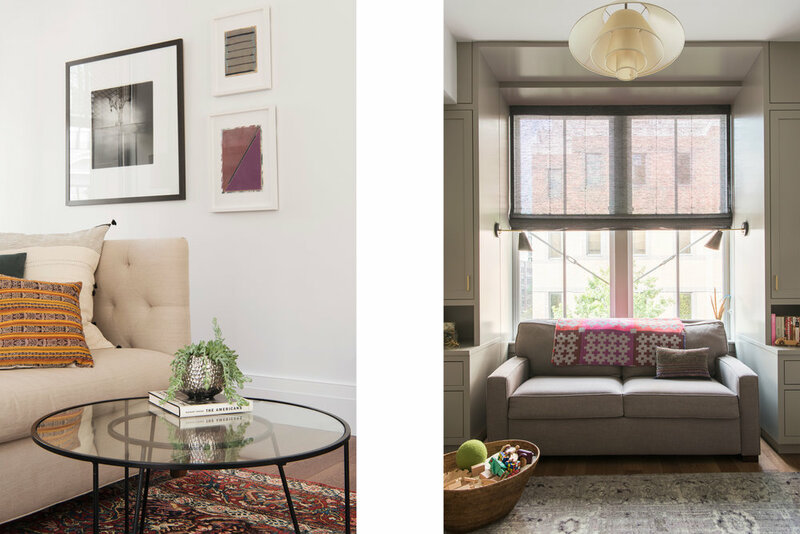 The Pierrepont Street Apartment is a 3 bedroom, 3.5 bathroom apartment in an historic, Brooklyn Heights bank building that was recently converted into residential units. Our team was hired to refine and rethink the developer details and layout of this spacious living space and also to furnish the entire apartment. After carefully reviewing budget and timeline with the client we recommended an entirely new kitchen (by HenryBuilt) and designed trim for doors, windows, and entryway walls to elevate the interiors to a new level of sophistication. Custom furnishings included a long, dining banquette, window coverings, custom free-standing cabinetry. All decorative lighting was selected by our team as well as all furniture and textiles throughout the apartment.